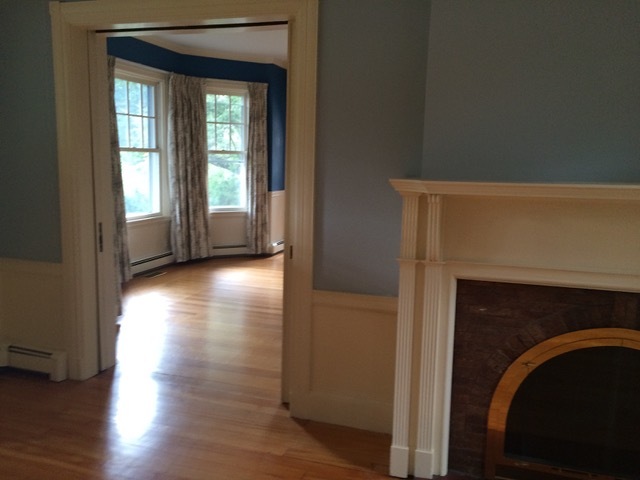 Ahhhhh the Waban house. I know it feel like ages ago when I first posted the reveal of this beauty, but as promised I'm back with some before and afters (and sources)! You all got the chance to see the transformation of the kitchen and the great room, and now I'm so excited to share the design process behind the dining room and entry. From beginning to end, this is one you have to really see to believe and honestly, had I not been in the house so much during the construction process, I never would have believed that I was standing in the same home! Before we get into the good stuff, let's go back.... way back! This is what the house looked like when my friend Meg bought the house. Just to recap, this is a home from the late 1800's that was a large, but crowded, old victorian. My friend's husband had a thing for old houses and somehow convinced Meg to get on board. I have to admit, when she first showed me the listing, and then when I saw the house, I had my doubts. In fact, I'm pretty sure my comment was, "this is going to be a lot of work." Luckily, she completely ignored me and went forward with the purchase of the home. They quickly brought on the incredibly talented design build team Chamberlain & Laliberte who had the vision to turn this once dark and dated house into the airy and modern home that you see below. When the team finished the project this was the unbelievable transformation. The arch in the dining room was removed and a wall was erected in its place. This allowed the homeowners to have a full built in bar and also provided more storage and flow for the kitchen. The floors in both rooms were original, but were sanded and stained to match the new flooring in the great room. As you can see the fireplace surround was updated and everything got a fresh coat of paint. When I came into this project, I had very little parameters and felt incredibly luckily to have such a clean and fresh space to work with. With their design team my friend and her husband had chosen the wallpaper and the light fixture for the dining room, but other than that both rooms were empty. As with the rest of the home, I knew my friend preferred neutrals so I didn't want to stray too far from that. The only thing I knew going in was that I wanted to bring in some cool tones to balance out the tan floors and walls, but other than an idea of tones I had no solid plans until I began to work up the room. From the beginning I knew that I really wanted that nailhead wallpaper to be the star but my design for this room began and ended with that rug. For me brown is a hard color to work with. I know some designers love it, but it's not a color that I ever use in my work. Very early on in my rug search I discovered this one from Serena and Lily, and I loved the pattern so much it almost made me love the color brown. Funny enough, even though the rug was the first thing I chose for this room, it was the last piece to arrive given its lengthy backorder status. I knew that it was going to be the piece to bring everything together and man, did it ever! Once I picked the rug I moved straight to the dining table. The room isn't large so I knew I wanted to do an oval table in here. Once I saw the brass base on this one I knew it was the clear winner. The sideboard and bar cart were chosen to highlight the brass on the table and eventually the brass lamp was added to bring it all together. Initially, I had planned to try to squeeze ten smaller dining chairs around the table but knowing that comfort was king for this family, I decided on eight. After a search of every gray upholstered chair on the Internet I fell head over heels in love with these Mitchell Gold beauties and so did my client! I swear, it's almost as if these chairs were made for this table! I love the coolness and casualness they bring to the space and I obviously Ochose them for their stunning legs. They are also made of a material that is very easy to clean, making them the perfect choice for this family with young children. After the main pieces were chosen, it was all about that artwork. 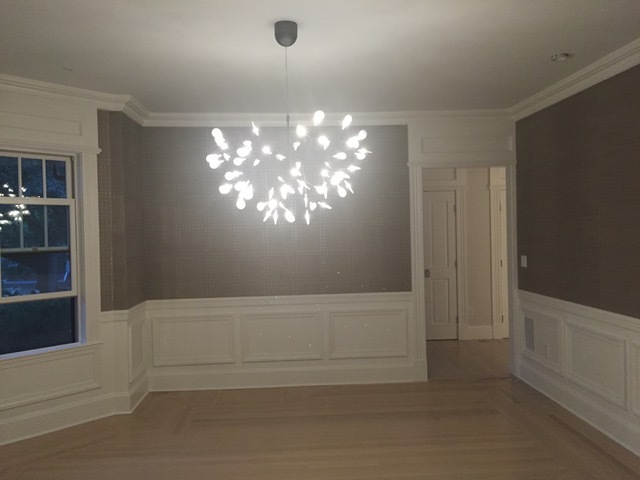 This was the first "formal" dining room that have I designed and even though I wanted it to feel elevated, I didn't want it to feel stuffy. This is a modern day family and they aren't the kind to host long and elaborate dinner parities. I wanted this space to be one that you could have Thanksgiving in, but also one that you could have pizza in as well. The artwork was chosen to bring in a bit of casualness to the space. The framed textile adds in so much texture, and the Namibian landscape some lightness. 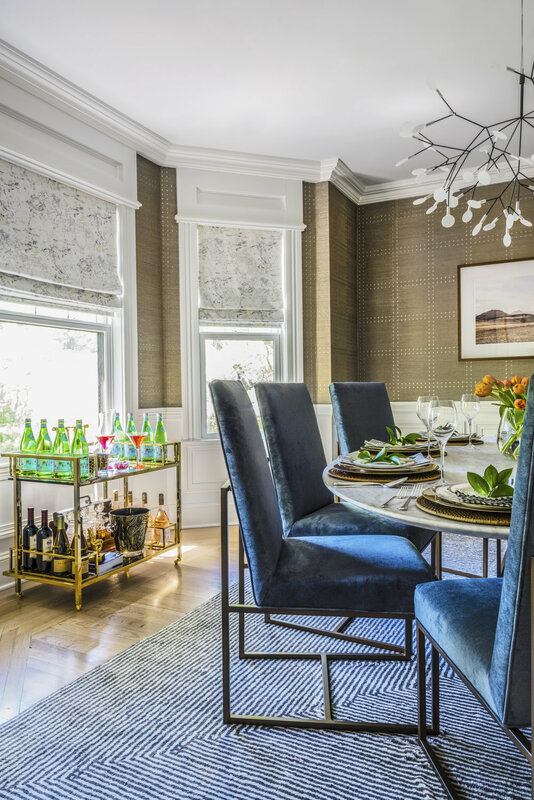 The fabric for the roman shades was chosen to bring all the elements together, specifically the gray and the tan, while adding a pop of brightness which I felt the room needed. I kept things simple above the fireplace, adding in a antiqued mirror as a nod to the old house and some personal mementos which include the families' crest, a map celebrating their Canadian heritage, and a commissioned a drawing of the original house as it was when it was first built. Those personal touches really make the space feel unique to the family and gave it the little bit of life that it needed. Once I had decided on the overall scheme for the dining room, I immediately moved to the entry given that I had a pretty solid idea of what I wanted to do there. The two spaces were connected so I really tried to treat them as one. From the beginning I knew I wanted to do a black round table to bring your eye to the center of the room. The beauty of old houses is that the rooms are often very large but this can also make them feel overwhelming. The table makes the room feel smaller and homier and also provides impact when you immediately walk the room. The rug from Serena and Lily (which I use in almost all my projects!) softened the look of the table and really tied in the flooring. I had known that I wanted to do a mirror over the fireplace and when my friend sent me this one that she saw in Lonny, it was so clear that it belonged here. The mirror is handmade from a local company Ben & Aja Blanc and I was able to learn more about the mirror itself when we picked it up! It's hand died Japanese silk and I love how unique and interesting the piece is. Once we had decided on the mirror my only job was to not take away from it with the rest of the design. To that end I chose only black and white photographs for the rest of the space and the one over the console is actually an image from Costa Rica! I think it's probably my favorite piece in the house because it's like I left a little piece of me there. I accented the mantle and console with some simple pottery and I think this room is the perfect example of how you don't have to overdo it to get good design. I think it's so beautiful because it's so simple and I'm so grateful that my friend trusted my vision completely, and from the beginning!